News | Aerodyne Research, Inc. The General Assembly 2019 of the European Geosciences Union (EGU) is held at the Austria Center Vienna (ACV) in Vienna, Austria, from 7–12 April 2019. The assembly is open to the scientists of all nations. Aerodyne will be attending - check us out at booth # 59! Aerodyne Research was one of ten companies invited to participate in the SBIR/STTR Innovation Awareness Day program sponsored by the U.S. Small Business Administration on December 8th at the Rayburn House Office Building on Capitol Hill. ARI announces the acquisition of a next generation mobile laboratory. The newest vehicle in the fleet will expand our deployment payload for the instrumentation to quantify trace gases and aerosol characterization. We are delighted that this new mobile laboratory has more capability and still has a decent turning radius! ARI is exhibiting our instruments at the 34th Annual Conference of the American Association for Aerosol Research (AAAR) October 12-16, 2015 at the Hyatt Regency Minneapolis, Minnesota. Dr. Leah Williams, principal scientist at Aerodyne, is treasurer-elect of the American Association for Aerosol Science (AAAR). Leah has been an enthusiastic member of AAAR for more than ten years. She served on the Board of Directors from 2012 to 2015, has served on the Education Committee, and been active in the Aerosol Chemistry and Atmospheric Aerosol working groups. Aerodyne Mass Spectrometer is featured in the American Geophysical Union Blogosphere: GeoSpace, August 13, 2015. "Scientists track air pollution by meal times" by Leigh Cooper shows the Hong Kong University Science and Technology Group lead by Dr. Chak Chan using our AMS to monitor organic aerosols from cooking. April 2015 - Opening ceremony of Aerodyne - Peking University Joint Center for Atmospheric Research. (Figure left) Left to right: Prof. Tong Zhu, Dean of the College of Environmental Sciences and Engineering, PKU; Dr. Charles E.
Aerodyne Research will be exhibiting at the EGU 2015 in Vienna, Austria, April 12-17 on the Green Level, Booth G11. Many or us will be in attandance during the conference as well as at the booth - please stop by! Volunteer aircraft needed for general aviation research. As part of the Wintertime Investigation of Transport, Emissions, and Reactivity (WINTER 2015) Campaign, three Aerodyne mass spectrometers are currently aboard the NSF/NCAR C-130 measuring the chemical transformations of air pollution in the winter time. Awarded the 2014 Fuchs Award - Doug Worsnop, Vice President and Director, Center for Aerosol and Cloud Chemistry – Busan, Korea, September 1, 2014. The Fuchs Memorial Award recognizes outstanding original research contributions to the field of aerosol science and technology. President Dr. Chuck Kolb accepting the award with pride at the 13th annual DOE Small Business Expo. The award recognizes Aerodyne for expanding DOE's high-tech research and development competitiveness critical to our Nation’s economic prosperity. This is the second time Aerodyne has been recognized as the DOE Small Business of the Year. E-31 Committee held its 2014 annual meeting at ARI June 2-6. The SAE International committee on the measurement of aircraft engine emissions, the E-31 Committee, held its 2014 annual meeting at ARI June 2-6. 28 April through 2 May, 2014, Vienna, Austria - ARI exhibited at the 2014 meeting of the European Geophysical Union, Vienna, Austria. Dr. Jesse Kroll was awarded the AGU 2013 James B. Macelwane Medal at the AGU Fall Meeting honors ceremony. This award is given for significant contributions to the geophysical sciences by an outstanding early career scientist. Dr. John Jayne has been elected Vice President, Instrument Systems Development and Production by the Aerodyne Research Board of Directors effective September 30, 2013. Dr. Jayne is also Co-Director of Aerodyne's Center for Aerosol and Cloud Chemistry. Dr. Chuck Kolb is a candidate for 2014 President-Elect of the American Chemical Society. Aerodyne Research is among seven chosen from across the country for a Phase II grant from the EPA Small Business Innovation Research program. This grant is to improve the development of a small aerosol mass spectrometer designed to automatically measure atmospheric PM2.5 chemical content. 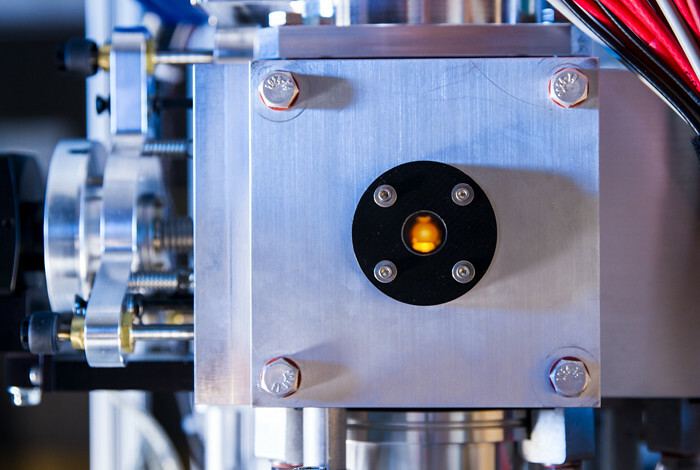 The US Department of Energy, Office of Science, highlights the Aerodyne Time-of-Flight Aerosol Mass Spectrometer developed under their Small Business Innovative Research (SBIR) and Small Business Technology Transfer Office (STTR) program. The 14th Annual AMS Users Meeting will be held in Prague on September 7-9, 2013, immediately following the European Aerosol Conference. Congratulations to President Charles Kolb for his recent election to the National Academy of Engineering. Election to the National Academy of Engineering is among the highest professional distinctions accorded to an engineer. Academy membership honors those who have made outstanding contributions to "engineering research, practice, or education". Dr. Leah Williams is appointed to the 2012-2013 Board of Directors of the American Association for Aerosol Research, a nonprofit professional organization for scientists and engineers who wish to promote and communicate technical advances in the field of aerosol research. Aerodyne Research exhibits at the American Geophysical Union 45th annual fall meeting, December 2012. ARI displayed the Aerosol Chemical Speciation Monitor and the Continuous Wave Quantum Cascade Cascade Laser Mini Trace Gas Monitor. A number of ARI scientists participated in the meeting's technical sessions. Dr. David Lewis receives degree Doctor of Science honoris causa. Dr. David Lewis receives degree Doctor of Science honoris causa from Amherst College President Carolyn Martin, May 20, 2012, Amherst MA. Aerodyne authors Dr. Manjula Canagaratna and Dr. Nga Lee Ng are interviewed by Thomson Reuters Essential Science Indicators Science Watch for highly cited paper in the field of geoscience. Dr. Canagaratna, Dr Ng and other authors are recognized by Science Watch for co-authoring one of the most-cited papers in the field of Geosciences during the past two years..
Aerodyne aerosol mass spectrometers and their role in atmospheric research is highlighted in C&EN. Research into atmospheric aerosol particles has accelerated in the past decade, propelled in part by advances in reliable and portable instruments from Billerica, Mass.-based Aerodyne Research. Aerodyne authors are recognized by Thomson Reuters Essential Science Indicators Science Watch for highly cited paper in the field of geoscience. This award recognizes an outstanding doctoral dissertation in the field of aerosol science and technology. John Conant appointed director of The Inter-Society Color Council. John Conant is appointed a director of The Inter-Society Color Council. The Atmospheric Sciences Section of the American Geophysical Union awards the 2010 Yoram J. Kaufman Award for Unselfish Cooperation in Research to Dr. Douglas R. Worsnop. Aerodyne's gas sampling probe is spotlit in the Air Force SBIR/STTR Advantage. Dr. Dougas R. Worsnop is awarded a distinguished professor position with the Academy of Finland. The FiDiPro programme is a funding programme jointly launched by the Academy of Finland and Tekes with the aim of recruiting professor-level top researchers. The goal of the Finland Distinguished Professor Programme (FiDiPro) is to raise the level of scientific and technological knowledge and know-how in Finland and add a more international element to the Finnish research system. Dr. Barry McManus elevated to rank of Fellow by the Board of Directors of The Optical Society of America for the design, fabrication, and utilization of innovative tunable infrared laser instruments to address air quality and global change issues. Washington D.C. – Dr. Douglas R. Worsnop of Aerodyne Research, Inc. has been awarded the distinction of AAAS Fellow. Election as a Fellow is an honor bestowed upon AAAS members by their peers.